Manchester United goalkeeper David De Gea has been slammed by fans on social media after his mistake led to Granit Xhaka opening the scoring for Arsenal today. De Gea looked completely bamboozled and confused by Xhaka’s strike in the 12th minute of the clash, the Spaniard took a step the wrong way and the ball hit the back of the net. There may have been a massive amount of swerve on the strike, but it really didn’t look very threatening and De Gea should have stopped the ball from hitting the back of the net. 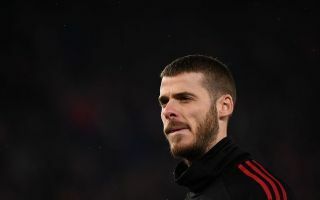 Echoing the words of Liverpool boss Jurgen Klopp – the wind may well have been a factor for De Gea’s uncharacteristic momentary lapse in concentration. De Gea simply completely misjudged the strike and was left red-faced when it went in. The Red Devils are unbeaten in all competitions under Ole Gunnar Solskjaer, losing just once – the first-leg of their Champions League clash against PSG. I wouldn’t be surprised if Solskjaer’s side managed to spark a comeback against the Gunners. Very strange from Dave. Still have faith. Most overrated Goalkeeper ever always makes a mistake or two. I don't think I've ever said this but David de Gea has been really poor so far today, he has been quite sloppy on goal kicks and that goal was a mistake from him. Still so much time left, time to wake up. De Gea better than Alisson ? Anyone that says David De Gea is better than Alisson can do one! Alisson is miles ahead of De Gea . De Gea better than Alisson… okay then ??? A loss for United today would dent their hopes of finishing in the top four. At this stage it looks as though Arsenal, Chelsea and the Red Devils are all vying for the final spot in the top four.